Kaeser & Blair is One of The Best Direct Sales Companies for Those Looking for More Financial Independence. Are you part of a family looking to gain more financial independence? Are you saving for the kids’ college funds, or simply wanting to ensure the bills get paid each month? 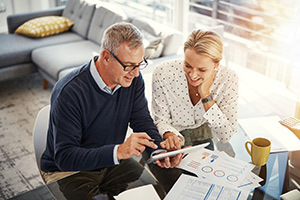 With these financial goals in mind but little time to make them a reality, you may be thinking about getting involved with a direct sales company. Kaeser & Blair is one of the best direct sales companies for people looking for greater financial independence without the risk. Fitting more work into your already-busy schedule may seem impossible. However, with Kaeser & Blair you never have to worry about conflicting schedules or meeting quotas that are out of reach from month to month. You are your own boss; no quotas, no long hours, no repercussions for not reaching certain goals. You work whenever you want, wherever you want. You can work from home or on the go, for as long as you want. The flexibility we provide makes Kaeser & Blair one of the best direct sales companies to join. Kaeser & Blair has been in business for over 100 years, and that’s no accident. Our quality experience means we have everything figured out, so there’s no guessing about what does and doesn’t work. We take care of shipping, billing, collections, taxes, credit issues and liability so you don’t have to worry about anything except selling. You don’t have to purchase any inventory, either. K&B is one of the best direct sales companies because we’re only worried about one thing: helping you succeed. The above issues are ones we’re more than happy to take care of so you can reach the goals you set for yourself. The promotional products industry recently hit $21.5 billion in sales and is only expected to keep growing. This growth is unrivaled by many other companies, making Kaeser & Blair one of the best direct sales companies in regard to job security. Getting involved in a new field can be frightening, especially in today’s economy. We know that you want to be completely sure you aren’t going to regret becoming involved in our industry, but we guarantee that you’ll never have to worry about keeping your business afloat. Another reason Kaeser & Blair is one of the best direct sales companies is our incredibly low startup cost. For the one-time investment of $85, you can receive the Standard Business Owner Package. In it, you’ll find all the tools you need to start your business. This includes our Best Buys catalog, which tells you exactly which products sell best so you don’t have to figure it out yourself. Once you reach your first $1,500 in sales, your $85 investment is refunded to you, making this opportunity extremely low-risk. Or, if you decide direct sales aren’t for you in the first 30 days, we’ll give you your $85 back with no questions asked. If you’re still on the fence about becoming a Kaeser & Blair business owner, you should know that some of our part-time business owners have made up to $20,000 per year (although there’s no cap to how much you can make.) Should you choose to make your business your full-time job, you have the potential to make from $60,000 - $185,000 per year. Many other direct sales companies place a cap on how much you can earn, but not Kaeser & Blair. We want you to earn as much money as you can to meet your personal goals, not limit you in any way. Still aren’t convinced that Kaeser & Blair is one of the best direct sales companies to join? We’ll send you a FREE TRIAL LAUNCH PACKAGE so you can see for yourself. By requesting our Free Trial Launch Package, you have a 100% risk-free way to know what you’re getting involved in before you sign up. What are you waiting for? Become a business owner with Kaeser & Blair today!